Know what part of your cloud security and compliance is your responsibility. The cloud enables organizations with all types of infrastructure arrangements to deploy their data with unrivaled efficiency. However, this doesn’t mean that a one-size-fits-all approach exists. 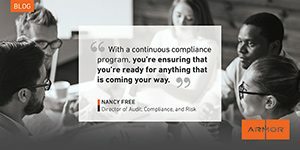 Each data type, workload, application and organizational makeup will have a unique set of requirements to meet before they can be considered “secure” by regulatory standards. To help clarify some standard of relationship between cloud vendor and customer, companies like Microsoft Azure have adopted a Shared Security Responsibility model that outlines who is responsible for securing certain aspects of the cloud. Understanding how your organization fits within your vendor’s Shared Security Responsibility Model is crucial to your cybersecurity. A study by Gartner predicts 95% of cloud breaches through 2020 will be due to customer misconfiguration, mismanaged credential or insider theft. In a digital environment where breaches are becoming more common, failure to fully understand your and your vendor’s security responsibility can lead to a breach. To help organizations manage their cloud security responsibilities, Armor’s Armor Anywhere can integrate into the cloud for a full-stack security monitoring and management solution. Watch our “Shared Security Responsibility in the Cloud” webinar and learn more about responsibility models and how they can affect your cloud’s cybersecurity strategy.